Can Advanced Audio Processing Be Done on an SoC? The automotive industry is starting to move in a direction that the computer and mobile technology industries did more than a decade ago: performing audio processing on a system microprocessor rather than on a dedicated DSP. By eliminating the dedicated DSP and the microprocessor, flash and RAM chips that support it, and moving these functions onto a system-on-a-chip (SoC), a savings of about $10 to $15 per vehicle can typically be realized. System architecture is simplified, and system updates are simpler because the entire updates are coded for a single device. Yet at the same time, automotive audio processing demands are growing rapidly. Automotive systems are adding such advanced features as engine sound enhancement, pedestrian warning systems, and voice command – all of which add can add a considerable processing load on top of the resources currently needed for entertainment and voice communication. Can a less-costly, SoC-based system handle all of these tasks as well – and as reliably – as a DSP-based system? This is what we recently sought to find out. 1) TI Jacinto 6. 2 x ARMCortex A15 @ 1.5 GHz. 2 x C66x audio DSPs a@ 700 MHz. 3) Renesas R-Car H3. Quad Cortex ARM Cortex-A53 at 2.4 GHz. 500 MHz HiFi 2 audio DSP. 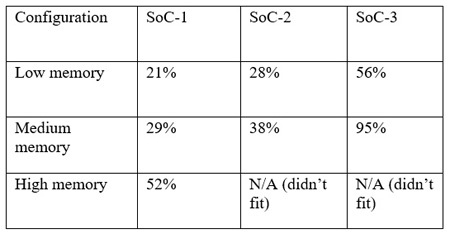 These tests weren’t intended as a comprehensive review of these processors, so from this point forward we’ll refer to them as SoC-1, SoC-2 and SoC-3. The test involved real-time processing, using Audio Weaver, of a typical fully featured high-end automotive audio system. Processing for stereo and 7.1 content, four announcement channels (for navigation, phone, etc. ), multiband compressors, loudness compensation, IIR crossovers for 21 speakers, eight zones of EQ, limiters, delays and more were included. We also made three variants of this system – with low, medium and high memory usage demands – by varying the filters used for the eight-zone EQs. 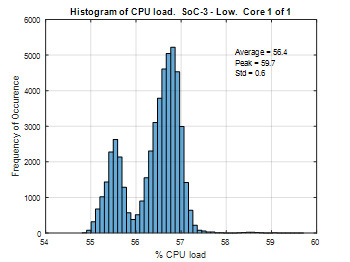 Except in the most extreme case – the high memory usage configuration – all of the SoCs handled the processing load, and SoC-1 and SoC-2 handled both the low and medium memory configurations with plenty of power to spare, even though only one processing core was used. Overall, we found that audio processing needs were stable, with the standard deviation in all cases being about 1% of the average CPU load. We did notice occasional spikes caused by other higher priority tasks interrupting the audio processing; this issue can be mitigated by setting the priority of audio processing correctly. 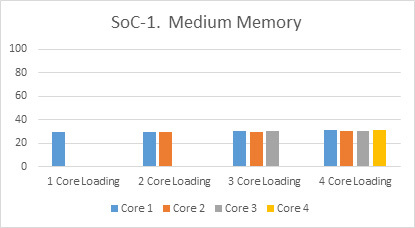 Even with four cores running simultaneously, the SoCs were able to handle the memory demands of the processors. Of course, there are still situations in which using DSPs in automotive applications is desirable – for example, when proprietary, licensed audio processing technologies developed for DSPs are used, or when time and resource limitations demand the use of familiar systems and designs. But our tests indicate that in many cases, a typical automotive SoC is able to support audio processing needs comfortably. For more information on these tests and guidance in designing automotive systems using SoCs, please reach out to us through the contact information listed on this site.